So, GUADEC has been too good to leave any time for blogging. Met a lot of very interesting people, a lot more to still meet. Have had a lot of good conversations about font stuff and pango. With cworth, keithp, mclasen, mathrick, moyogo, simos, danilo, glasseyes and Nicholas (what's your nick? ), we start talking fonts every now and then. With mathrick we even made pangocairo render a bit of vertical text. My presentation went Ok yesterday, and as everybody else already blogged, the Fluendo party at the beach last night was awesome. We also met vuntz which is a lot of fun trying to speak hish few Persian words. Lots of people losing their badges, but not us. In the last AGM, the board announced that Eben Moglen has agreed to join the GNOME Advisory board and act as a legal counsil to the foundation. Awesome news! In the lightning talks now. Next is cworth's talk about how to design clean API (as was done in cairo.) Looking forward to the maemo bday party tonight. Just because not only our Summer of Code mentors don't get a penny of Google's money, neither does the GNOME foundation! 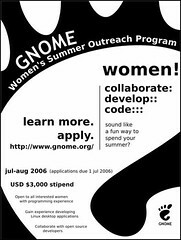 In a generous move, the GNOME Foundation is reinvesting benefits from the Google Summer of Code program into sponsoring three similar projects, for female studentss only. Thanks to Chris Ball and Hanna Wallach for coming up with the proposal, and driving it so far. The press release, the poster (PDF), and the Women's Summer Outreach Program 2006 page. Let your alma mater's CS department know. Spread the word!